Out on DVD in May 2011 - buy now! DVD £15.99 £9.99 plus delivery The famous film with Harry H Corbett, Ronnie Barker, Eric Sykes, etc. DVD £15.99 £9.99 plus delivery "Docu-drama" featuring the life and characters of the canals in 1945. DVD £5.99 plus delivery The first series of the Locks and Quays series shown on Granada Television, featuring Fred Talbot touring waterways in the North West. DVD £39.99 £27.97 1980s television series. All 13 episodes on 4 discs. "Lomax embarks on a search for his son and for the man who framed him..." A sort of The Fugitive on the canals. DVD £10.99 plus delivery Owners tell some sad and amusing tales of life aboard boats on Britain's canals and waterways. DVD £19.99 plus delivery 3 discs. A magical compilation of England's most beautiful waterways journeys. DVD £24.99 £12.97 plus delivery Includes: 'Working On The Canals', 'Living On The Canals' and 'Holidaying On The Canals'. DVD £17.99 plus delivery Visit to this canal through the Pyrenees (in English). Classic Train Journeys - Northern England DVD £9.99 plus delivery Footage from driver's cab and helicopter. Includes Cumbrian coast, Trans-Pennine Express, York to Berwick, Settle to Carlisle. Classic Train Journeys - Scotland DVD £9.99 plus delivery Footage from driver's cab and helicopter. Includes Fort William to Mallaig, Rannoch Moor, Inverness to Kyle of Lochalsh. Classic Train Journeys - Wales DVD £9.99 plus delivery Footage from driver's cab and helicopter. Includes Heart of Wales line, Cambrian coast, Tallylyn, Ffestiniog, Conwy Valley. Classic Train Journeys - Ireland DVD £9.99 plus delivery Footage from driver's cab and helicopter. Includes Rosslare to Dublin East Coast, Tullamore Steam, Western Line, Dublin to Sligo, Cavan & Leitrim narrow gauge, Lartigue Monorailway, Tralee & Blennerville Steam Railway. Classic Train Journeys - South West England DVD £9.99 plus delivery Footage from driver's cab and helicopter. Includes Cornish Main Line, branches to Looe and St Ives, Bodmin and Wenford Railway, London to Bristol at 125mph, etc. Fred Dibnah's Industrial Age DVD £16.99 £13.98 plus delivery Definitive story of Britain's industrial heritage. Fred Dibnah's Age of Steam DVD £19.99 £8.98 plus delivery Tracking the invention of the steam engine through its development into the driving wheels of today's transport and industry. Fred Dibnah - Made In Britain - Volume 1 DVD £19.99 £9.97 plus delivery Episodes 1 to 6. Fred travels Britain on his restored 1912 traction engine, searching out engineering and mechanical skills of a by-gone age. Fred Dibnah - Made In Britain - Volume 2 DVD £19.99 £9.97 plus delivery Episodes 7 to 12 of Fred Dibnah's last series. Fred Dibnah Boxset Made in Britain 1 & 2, Tribute & Age of Steam DVD £49.99 £18.97 plus delivery Four titles featuring the late Fred Dibnah. Includes "Made in Britain 1", "Made in Britain 2", "Tribute" and "Age of Steam"
Fred Dibnah's Ups And Downs Of Chimneys DVD £12.99 £9.98 plus delivery Follow steeplejack Fred Dibnah as he demolishes various chimneys, and enjoy his wit and wisdom. The Bargee VHS Video £10.99 plus delivery A comedy tale of a canal bargee with an eye for the ladies who is trapped into marriage. Showing many canal locations. Starring Harry H. Corbett. Painted Boats VHS Video £10.99 plus delivery The drama in the lives of two families who live on the canals boats of Britain. Starring Jenny Laird, Robert Griffith. Narrowboating - Waterway Magic VHS Video £1.69 plus delivery Explore the joy of Narrowboating. Based on the Worcester and Birmingham Canal and the River Severn. 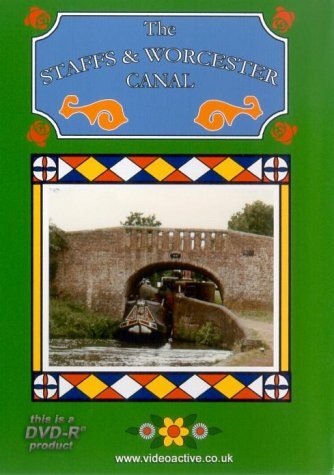 The Canals And Canal Boats VHS Video £2.99 plus delivery The history of the British canal and the canal boat, from Roman to modern times. With Brian Glover. Manchester Ship Canal - 1955-1964 - Vol. 1 VHS Video £24.80 plus delivery In 1955 Mike Lord travelled on his bicycle from Bolton to see the Manchester Ship Canal and took his cine-camera and tape recorder with him. The results are for us all to enjoy now. In this volume we travel up the canal from Liverpool to Warrington. Manchester Ship Canal 1955-1964 - Vol. 2 VHS Video £24.80 plus delivery Mike Lord and his visit to the Manchester Ship Canal from Bolton. Featuring over 120 ships, coal fired tugs, Austin Healeys and double decker buses for export.